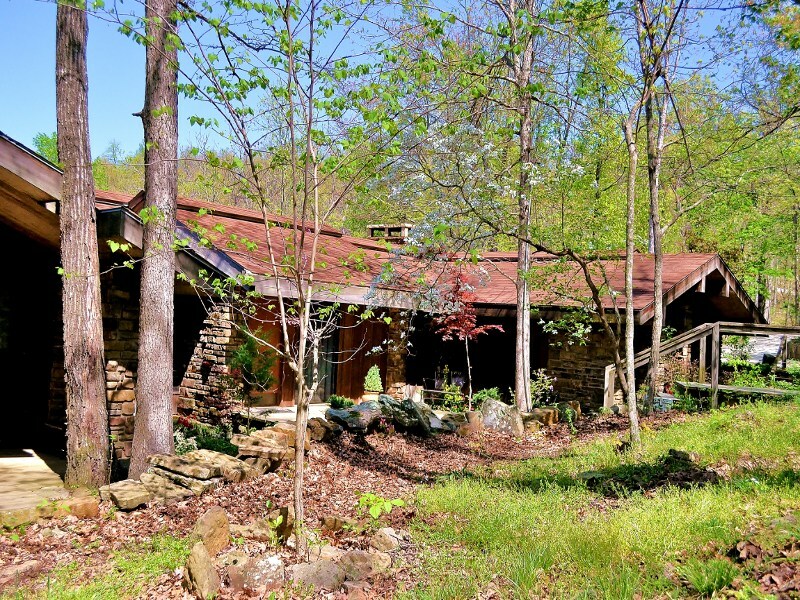 The lodge at Azalea Falls is a 3000 square foot home in the style of Frank Lloyd Wright, built entirely of rock, glass and redwood. 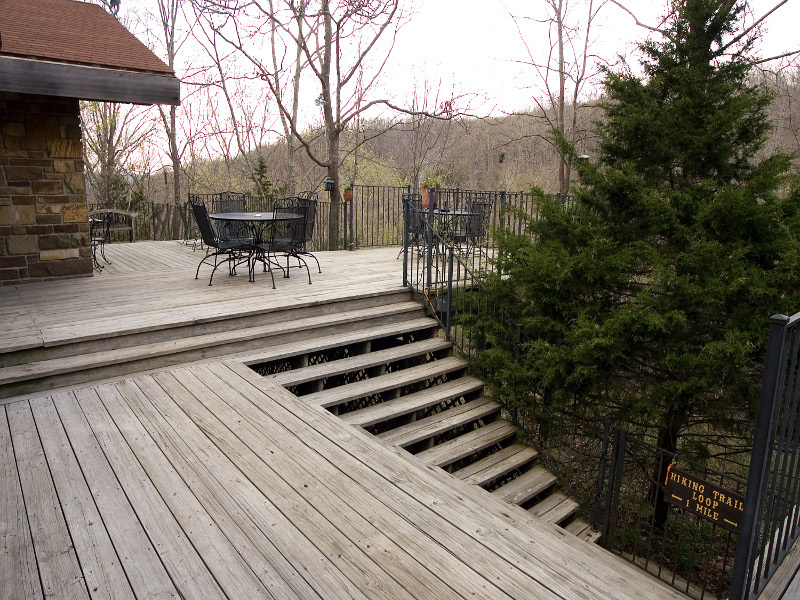 It is surrounded by 3000 square feet of decks and patios, overlooks a waterfall and offers 136 acres of woodland trails, creeks and surprise patios. 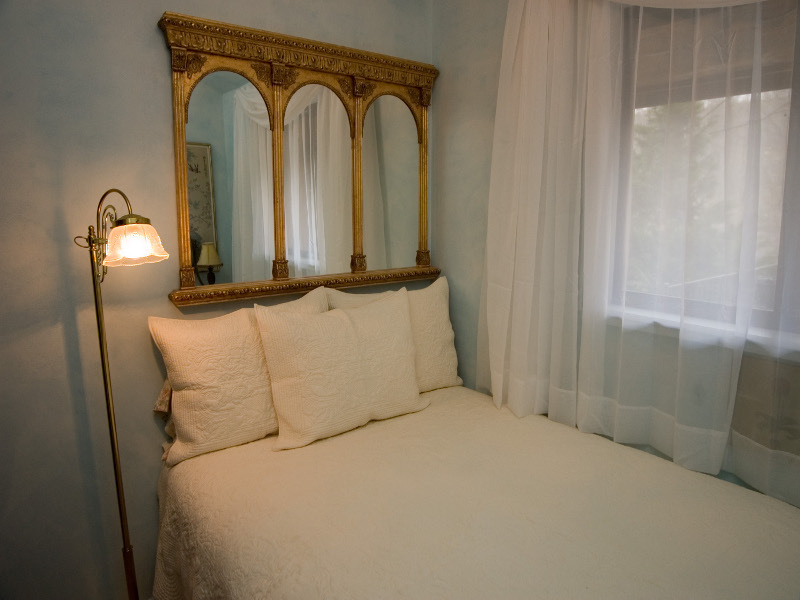 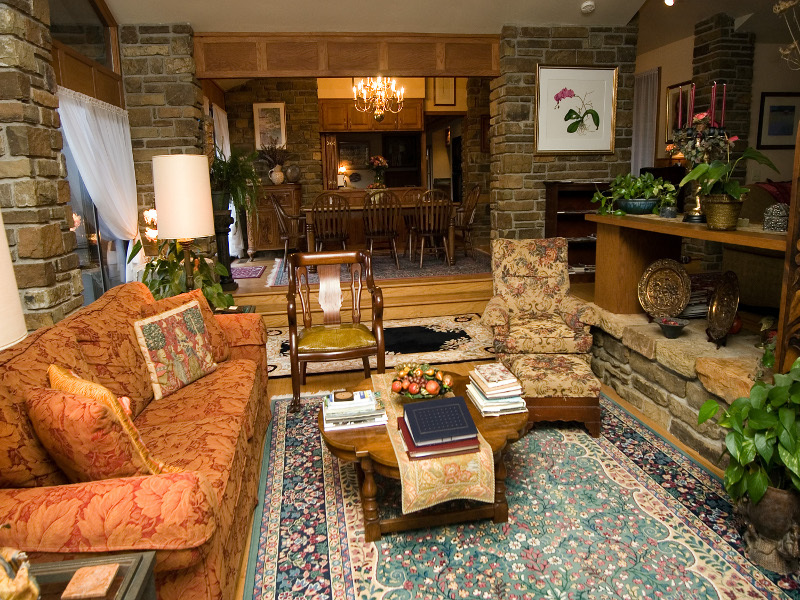 Filled with generations of antiques, collectibles and artwork, the lodge is fully appointed with satellite TV, complete stereo system, VCR, DVD player, and wifi internet. 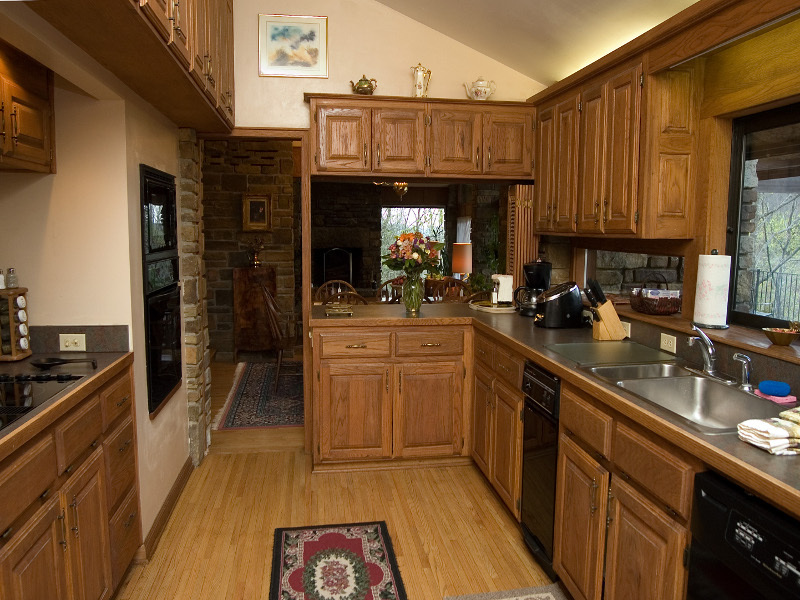 The kitchen is modern and equipped with all the cookware, utensils and dishes you will need as well as a microwave, oven, dishwasher and trash compactor. 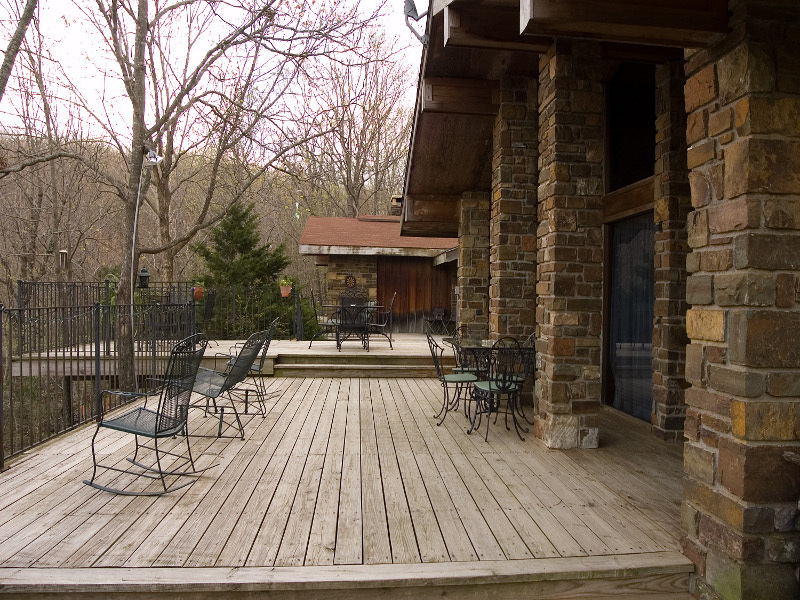 There is a propane grill for barbecuing on the deck. 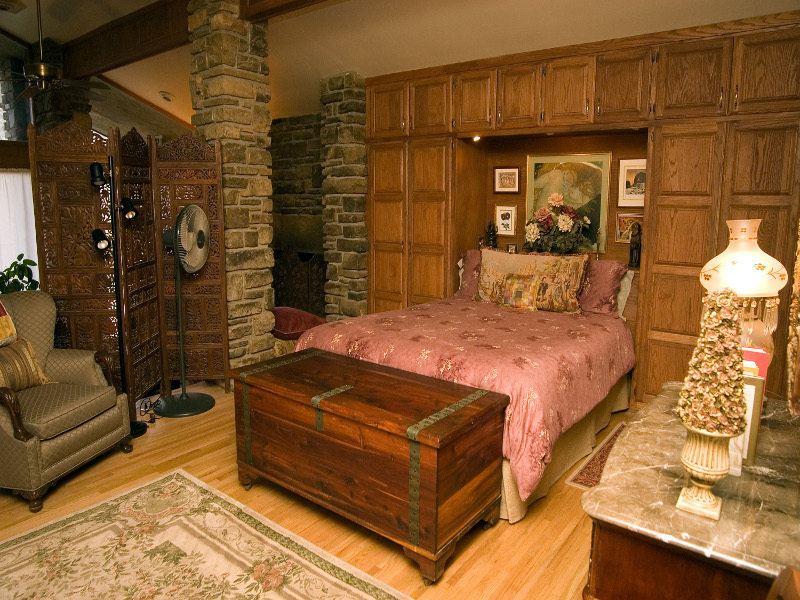 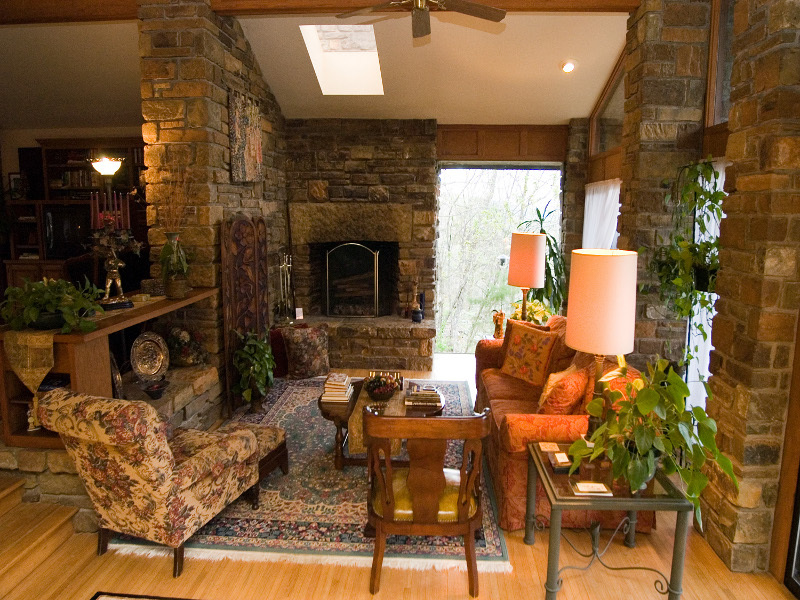 There are two large fireplaces, one in the master bedroom sitting area and one in the living room. 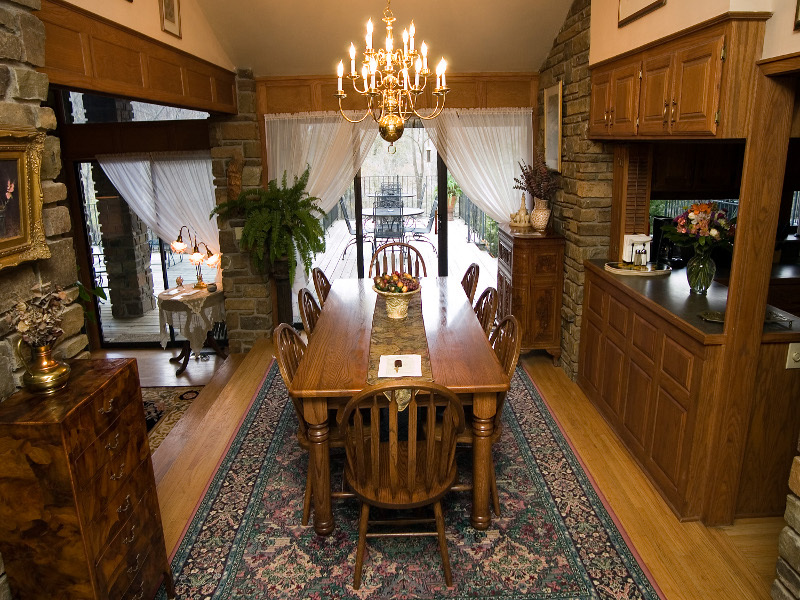 The lodge is rented in its entirety and with three full bedrooms, three couches that make into queen-sized beds and three full baths, the lodge can accommodate up to 12 people comfortably. 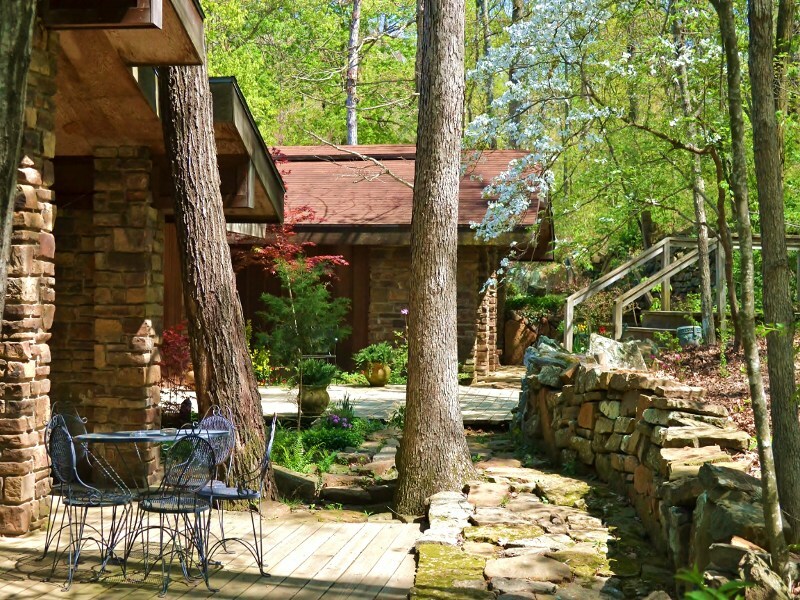 Staying at Azalea Falls Lodge is "like staying in a wonderful treehouse that overlooks an enchanted hollow." 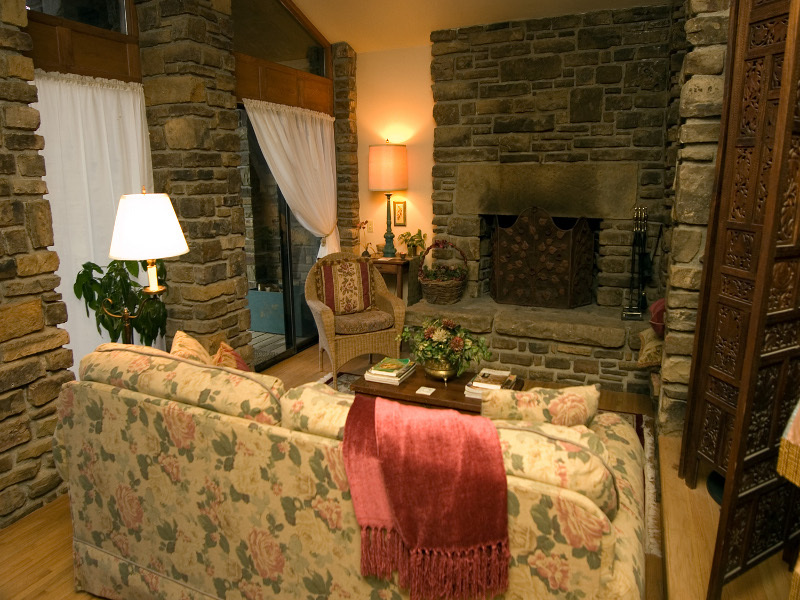 "At peace", "a spiritual quaility" and "magical" are some of the comments that have been used to describe the ambience of the lodge. 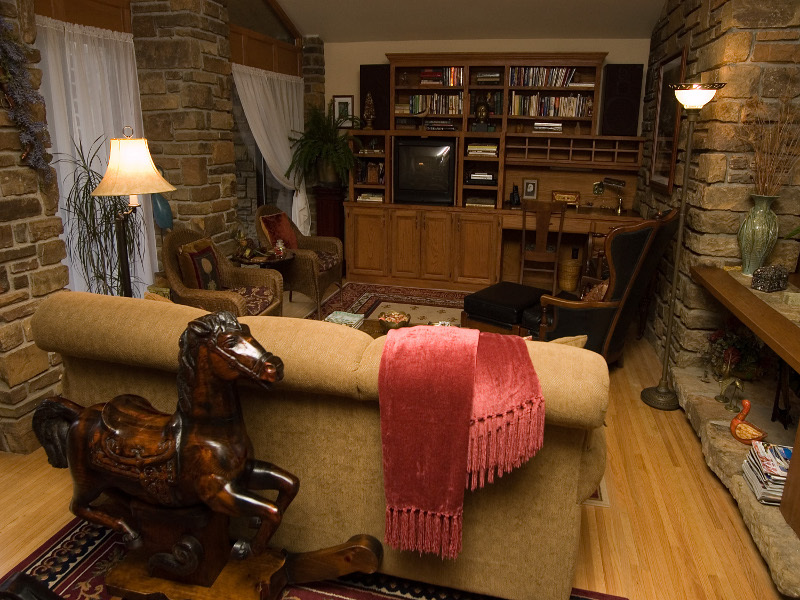 A couple looking for a magical romantic getaway or a group looking for an uncommonly comfortable place for their family vacation or reunion will find our luxurious vacation home or our deluxe cabin the perfect retreat for a weekend or a week.